"Rich or poor, the youth of the South were born to the saddle and learned to ride in infancy. The hunt, the steeplechase, the gymkhana, or tournament, were the popular diversions. The Southerner conducted his business in the saddle, whether overseeing a plantation, trading in the rural market, or touring the professional circuit as doctor, lawyer, preacher, or government agent. "[...] [W]hen the war came, the South had instant cavalry material. Tactical training might or might not be imposed, and often wasn't; Southern cavalry rode and maneuvered as later fighter pilots flew -- by the seat of their pants. 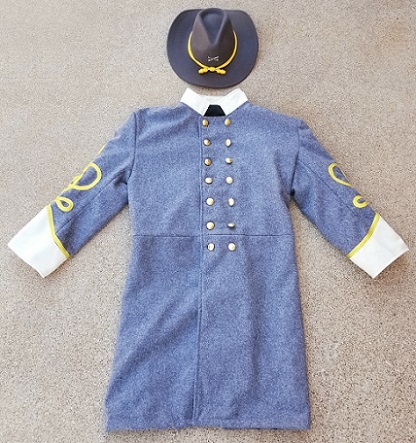 By contrast, most of the Northern cavalrymen, often arbitrarily assigned to that branch of service, knew horses only by proximity -- 'clerks and tailors on horseback,' training to turn them into accomplished troopers; and, looking ahead, those two years were sufficient. Basically, what the South had was a head start, not a permanent monopoly, not, in the final years of war, even an adequate fighting edge to see them through. "Horsemanship also developed qualities of daring, innovation, and independence in thought and action. A fence or ditch could not be cleared according to studious planning in advance. It could only be cleared with dash; and if that proved insurmountable, another approach would be instantly improvised. The same with facing an unpredictable enemy in this fast-moving fluid means of waging war. Advance orders were of little use; precise goals must depend on opportunities; slate-board strategy was a waste of time when speed and split-second decisions were the ultimate deciding factors." "In December 1862, Confederate cavalry in the western theater mounted a series of raids that, collectively, were the most successful mounted operations of the entire war. Led by Gens. Nathan Bedford Forrest, John Hunt Morgan, Earl Van Dorn, and Joseph Wheeler, the Confederate horsemen demonstrated their ability to engage in a new type of highly mobile warfare. They also demonstrated the potential for this new style of war to disrupt both the tactical and strategic goals of their opponents. In just more than two weeks of active operations, the Confederate cavalry in the West shattered the strategic plans of both the Army of the Mississippi under Gen. Ulysses S. Grant and the Army of the Cumberland under Gen. William S. Rosecrans, forcing these two armies to remain stationary for five months. The cavalry also exercised tactical influence on Rosecrans's forces at the Battle of Stones River by destroying major elements of the supply train of the Army of the Cumberland and by forcing Rosecrans to detach large numbers of troops to guard his tenuous supply line. Neither the Union nor the Confederate cavalries ever matched this unprecedented burst of activity for the remainder of the war." "By mid-1863, the majority of Union and Confederate commanders understood the importance of cavalry power. In the eastern theater of operations, however, only the Confederates seemed able to exploit it. From its inception, the Army of Northern Virginia projected an aggressive role for its horse soldiers, employing them offensively, in mass, and often far afield of the main army. As a result, Major General J. E. B. Stuart's troopers attained a record that far outshone their enemy's. "[...] The South's better perception of cavalry's potential derived from its traditional interest in horsemanship. The region had been led to war by men born to the equestrian tradition or who had gained familiarity with the art through daily necessity. Many had served in mounted militia outfits such as those raised out of fear of slave revolts. ... A region rife with open spaces and poor roads but handicapped by a severe shortage of wheeled transportation, the Southland had long produced in abundance material by which horsemen plied their trade. Many of the steeds ridden to war in 1861 were the offspring of thoroughbreds noted for endurance, strength, and speed. And many of those who rode such animals into battle came from generations of horse-breeders or from the families of blacksmiths, farriers, and veterinarians. As one soldier wrote of the Confederacy, years after its demise, 'probably no nation ever went to war richer in its cavalry raw material.'" "It was true that the average Southerner considered his saber more efficacious as a camp tool than as a weapon. While on horseback, he preferred to fight with his revolver; it seemed to answer better in close-quarters fighting and somehow appeared a more polite instrument of death. In battle, Rebels who encountered saber-wielding Federals sometimes shouted: 'Put up your sabres, draw your pistols and fight like gentlemen!'" "The Confederacy was not as fortunate in the matter of edged weapons for, if statistics are to be believed, Union hospitals treated less than 1,000 sword and bayonet wounds throughout the war. This suggests that the Southerners either used their cavalry less or preferred their firearms in action. Many Confederate men and officers were of course still armed with official United States weapons. At the beginning of the war, for example, the Southern cavalry would have carried either the 1840 Heavy Cavalry (Dragoon) Sabre or the 1860 Light Cavalry sword, but as supplies from the North ceased they had to rely on weapons of local manufacture and on imports." "... Stuart was partial to the saber. He strove to inculcate in his squadrons the value of tempered steel in close combat. Above all, he drove home the lesson that when used on horseback, any firearm delivers ragged accuracy, no matter how near his target."